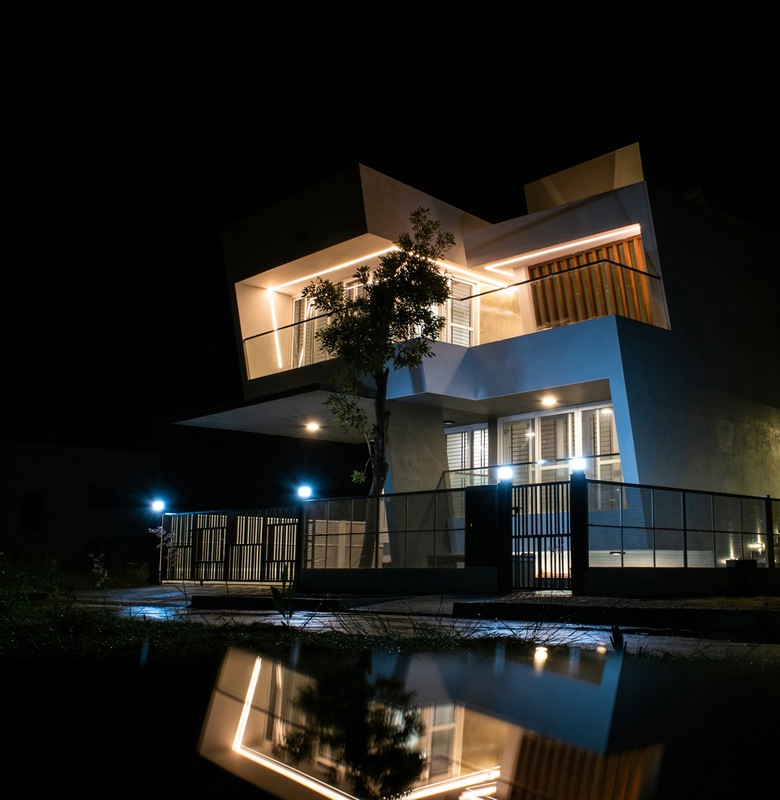 House in the Golf Course, Bengaluru, by Radical Architecture Design Consultants - ArchitectureLive! 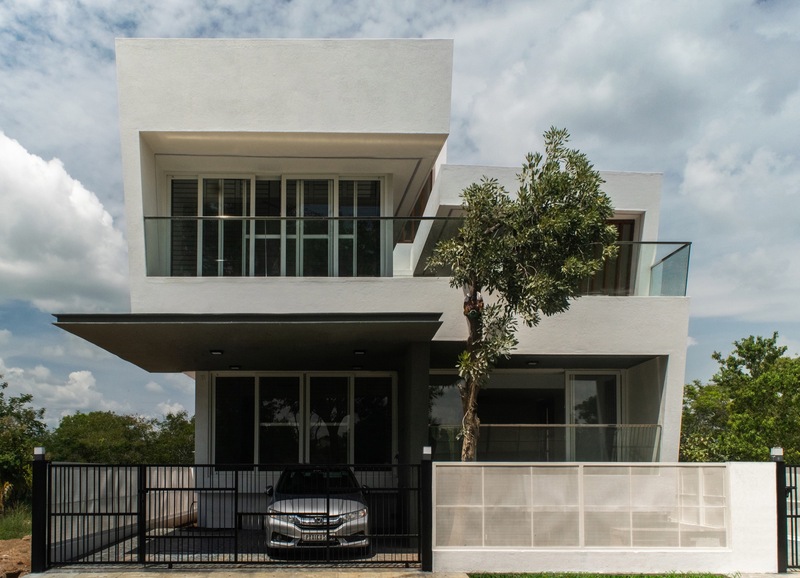 The brief required a residence for a family of 6 on a 3000 Sq.Ft of plot located in Eagleton Golf Village located in Bidadi in north-western part of Bangalore. Eagleton Golf Village is a “Neo-posh gated community” where aspiring Golfers abode. The client himself is a high- profiled Single-Malt scotch-connoisseur who flies around the world for his profession about whiskeys. So he was specific that his house should be an inviting retreat after a high pressure work day. The client and his young daughters being aspiring Golfers is the basic reason for their site to be selected in Eagleton Golf Village. The site is located in a natural setting with Lush greenery amidst the Golf-Course and in a very pleasant climate. The design brief was also mainly influenced by the restrictions of the “Eagleton Golf course design guidelines”. “The Eagleton Golf course design guidelines” imposed restrictions on the Building elevation profiles on all the four sides and the overhanging/ cantilevers or any projection on all the four sides as well. Yet we as Architects, Radically explored the maximum possibility in a highly restricted freedom of expression to exercise our unique design skill-set to create a “Unique Home” to reflect the modernist “style and personality” of our Client. Visual presence of the Golf Course and the existing park in every part of the home. 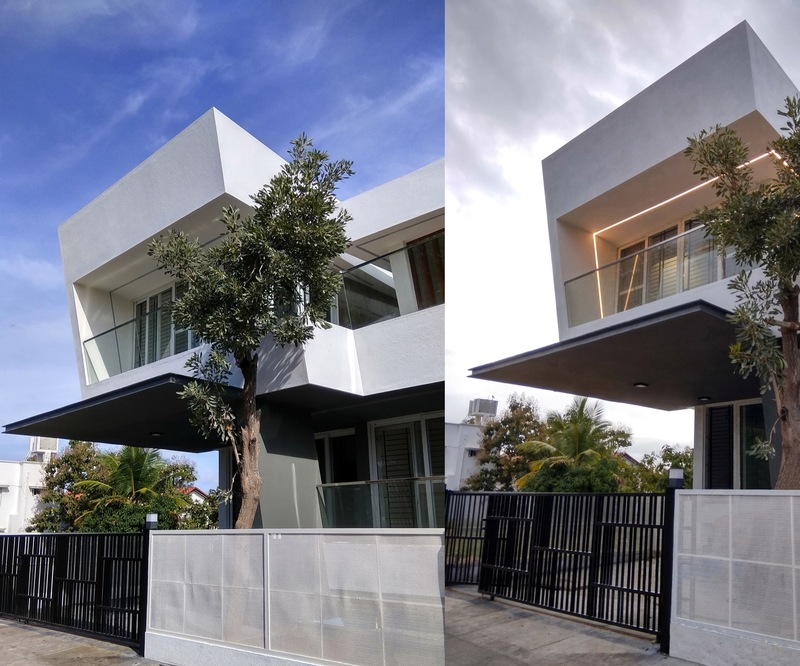 Maintaining the existing tree in site without removing and making it an integral part of the home. Increase the experience of fresh air, scenery and vistas than an indoor enclosed experience. The lines of force in the front elevation take a slight shift away from the tree. The location of the tree played a major role in the FORM of the building. Natural lights flood through the entire home through the strategically positioned fixed and sliding windows which are generous in size. The huge overhangs and cantilevers in the front part of the building not only adds to the slick modernist design vocabulary but assists in reducing the heat gain also since it is a south facing building. Working closely with the client, the house was zoned in three levels. The basement houses the Amenities like Bar, Home theatre, Yoga Court, Landscaped play area and maintenance – service room. 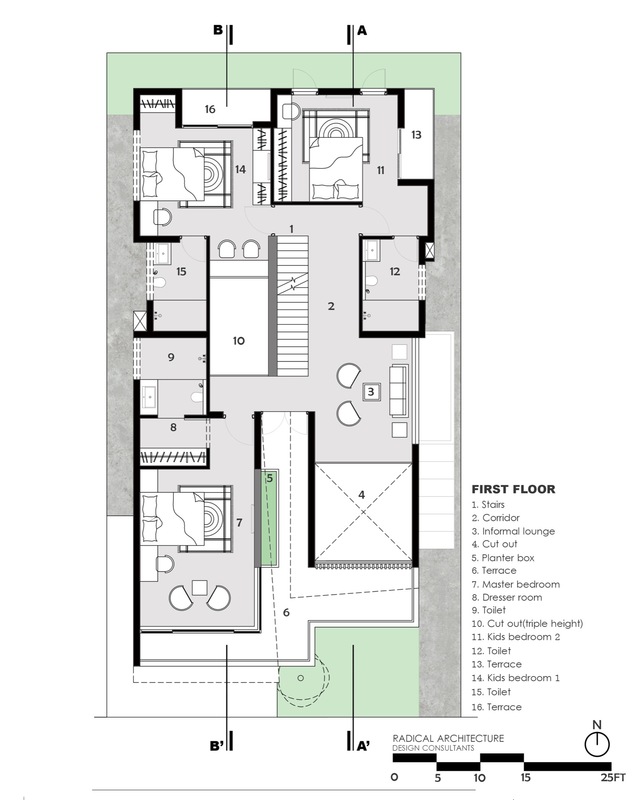 The common areas like Kitchen, Dining and Guest room dwells in the Ground floor. The first floor houses the private spaces like the master bedroom and the two daughter’s bedrooms. The important reason the main private rooms are placed in the upper level is for the client to have ample views of the front landscaped park and the sun-god temple in the front, for the two daughters to have lovely view to the Golf course in the rear and also to the flanking scenic beauty. 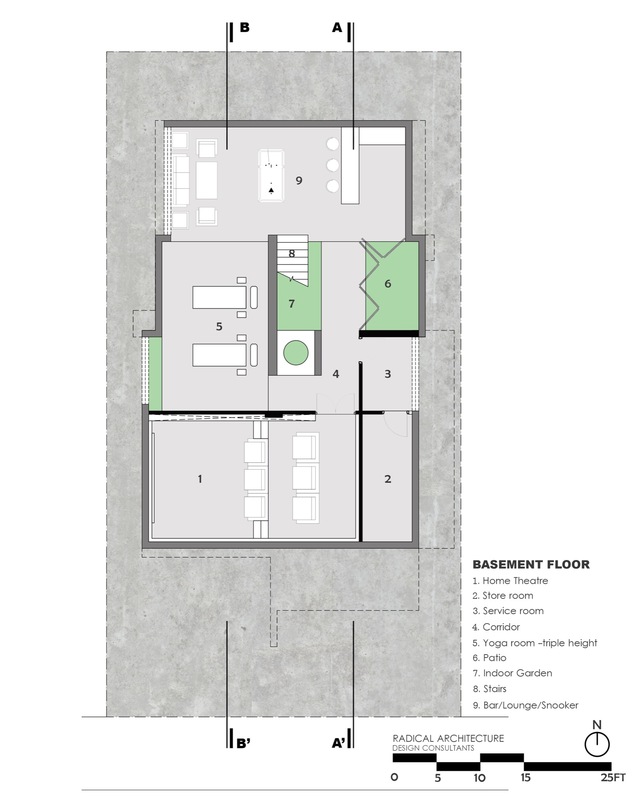 The first floor semi- public lounge overlooks the ground floor “double height” living room volume. 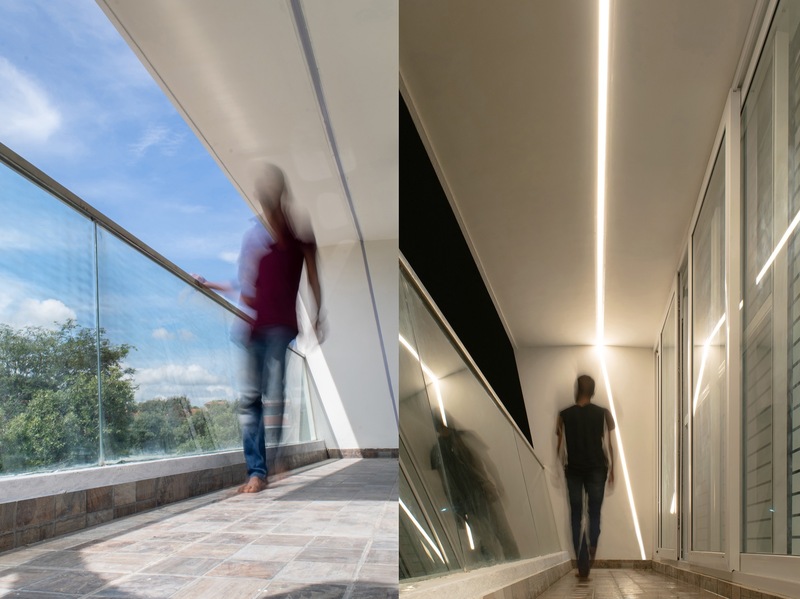 The abundance of the natural-light through the generous picturesque windows subtly changes the depth of this “double height” space at different time-zones in a day. 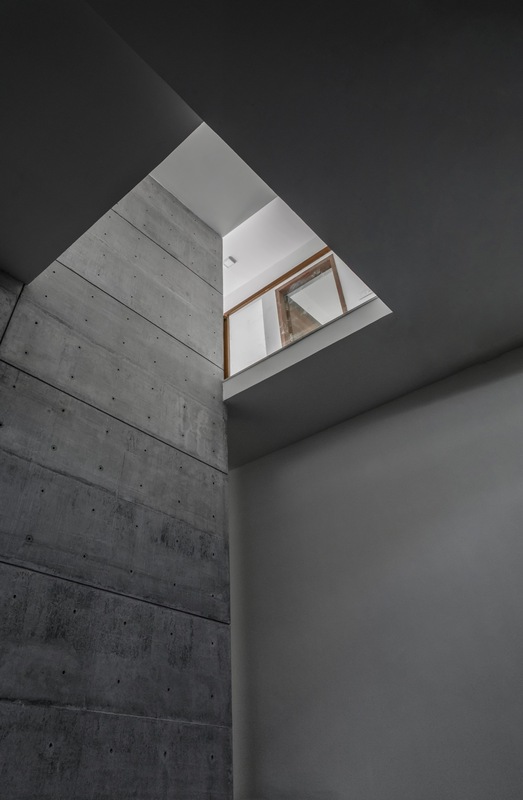 One of the key features of the Home is the very slim Straight flight staircase cantilevered from an exposed concrete wall. 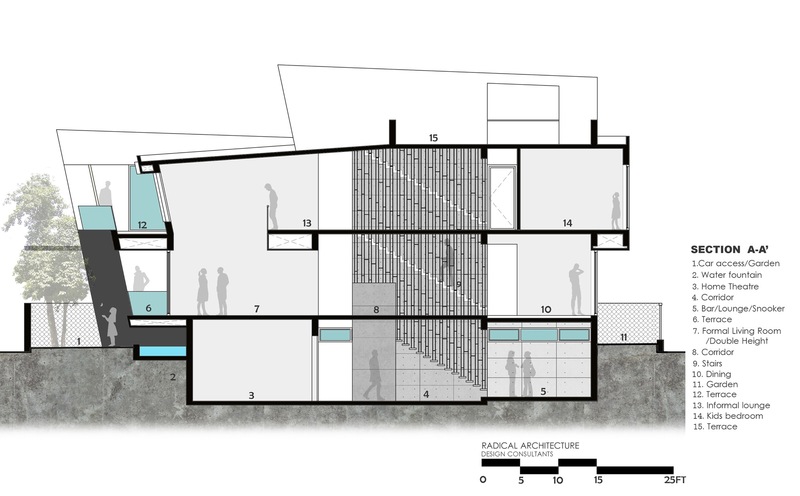 The basement floor is accessed through a straight flight cantilevered wooden steps whereas the First Floor and terrace floor are accessed through the Black Marble wrapped cantilevered folded staircase. The cantilevered staircase adds to the elegance of the house. 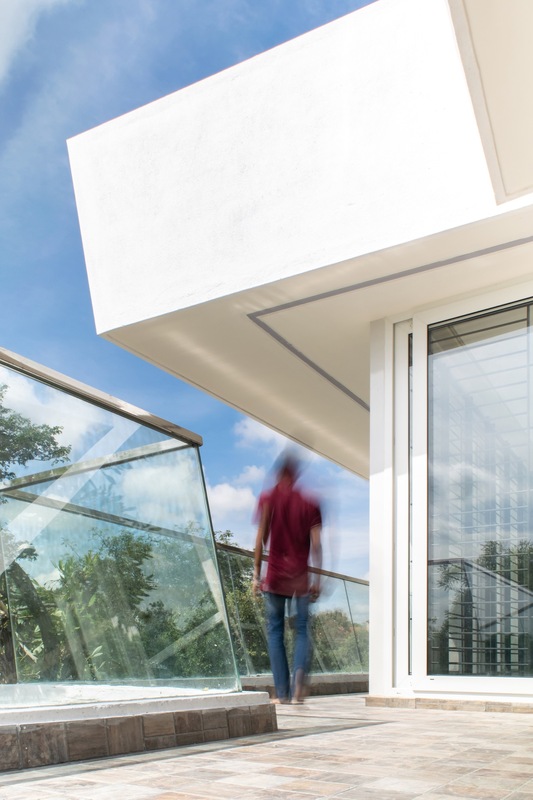 The minimalistic steel drops at the free end of the steps acts as the handrail. The exposed concrete wall in the background with thin staircase in the middle and the minimalist steel drops in the foreground appends to the Architectural milieu of the interiors. 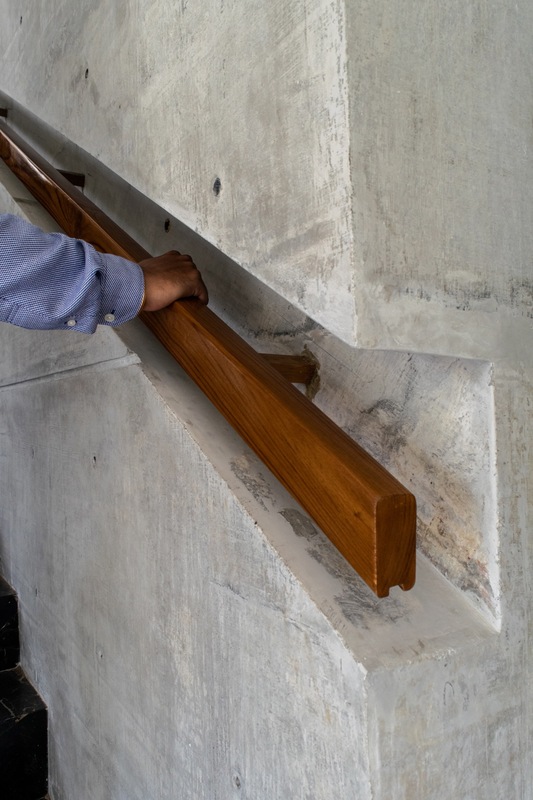 The handrails are placed in a carved out Niche in the concrete wall. The carved out Niche forms a unique dynamic shade in the daytime. The illuminating niche is functional and also adds a unique aesthetics to the staircase especially in the night. 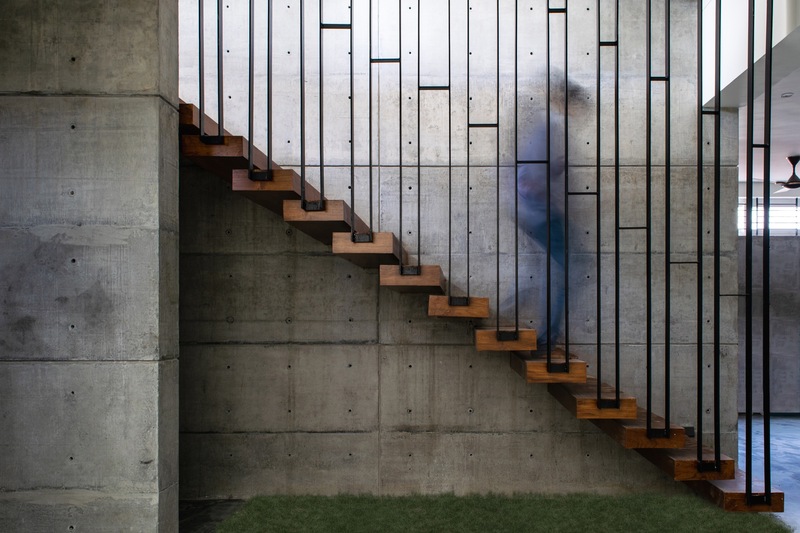 The exposed concrete wall plays an important role as a central key element of the home. Every common activity happens around the exposed concrete wall and so the Rustic and Brutal Architecture is experienced at every floor and in every layer of presence in the home. 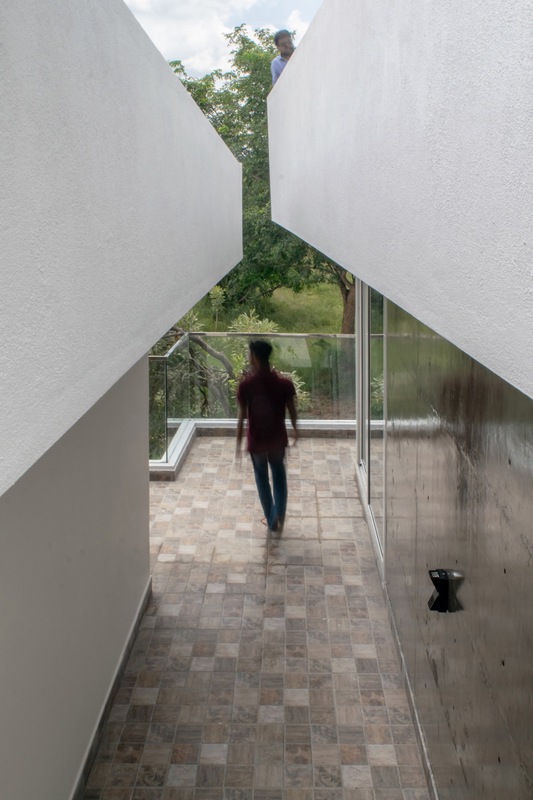 The exposed concrete shells are poured on site, which required careful detailing and intensive coordination with the structural engineer and the special contractor. 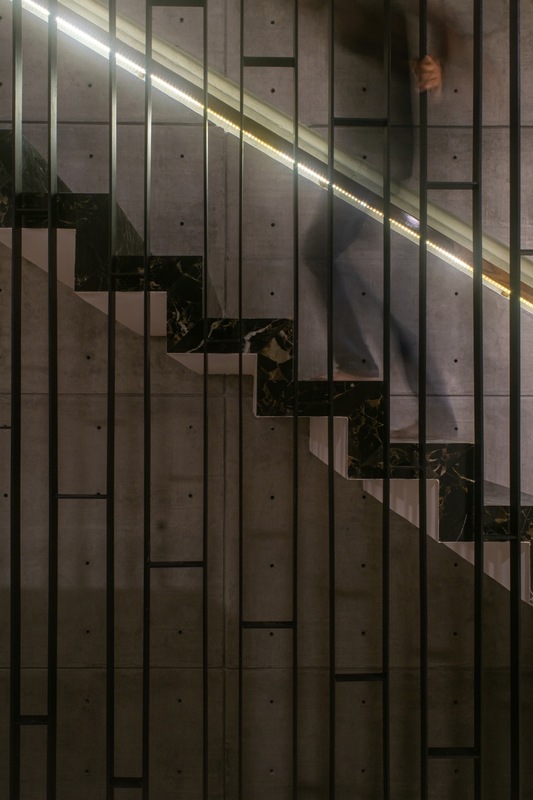 The neat clean straight lines and subdued detailing on the exposed concrete wall define contemporary aesthetic sensibility which runs as a unified theme throughout the staircase area. This theme gives the users a delicate and precise flight experience. The staircase becomes not only as an organizer for functional needs but also as a “Spatial Nexus” between spaces that need to be integrated. The character of the house turns out to be bright, inviting, and homey. The powerful Brutal Architectural presence of the exposed concrete wall, the windows in white aluminium and doors in teak bring the robustness of the interiors in play. Outdoor and Indoor spaces seamlessly flow into each other. The connection with the natural outdoor environment gives the house its exceptional living experience. The building responds to the local Bangalore climate which is pleasant for a major part of the year while it brings in plenty of natural light and ventilation in every room. 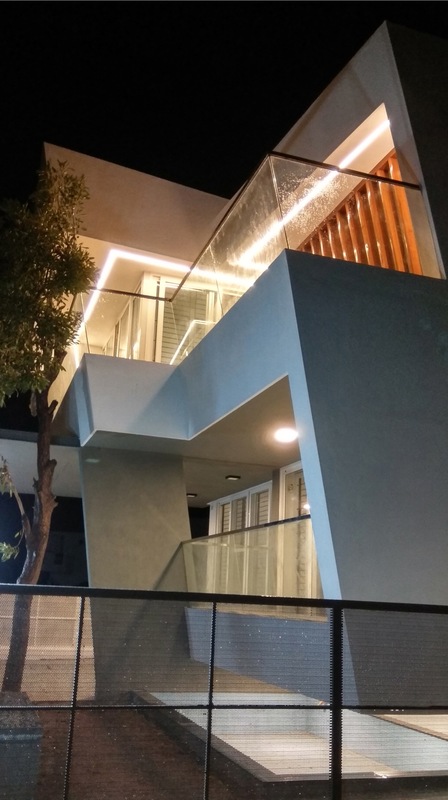 The outdoor connectivity, the subdued design language and ways the exposed concrete surfaces, slim-staircases, glass and lights are used gives the house its “Unique character of presence” in the whole gated- community and provide the client his ultra contemporary living experience. Lead Architects: Mani Vel Rajan, Janani Vedha. Project Team: Faizur Rehmaan, Kishore Sankar, Aravinth Shanmugam.